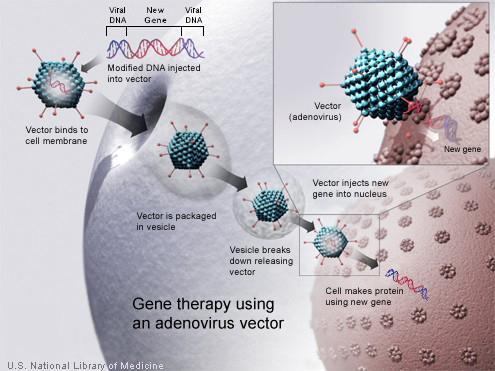 In this expandable image, a new gene is injected into an adenovirus vector, which is used to introduce the modified DNA into a human cell. If the treatment is successful, the new gene will make a functional protein.NIH U.S. National Library of Medicine. We are entering a new age of gene therapy, one in which years of painstaking research have begun to yield products that are delivering a meaningful benefit to human health. In the past year, three new gene therapy products have been approved by the U.S. Food and Drug Administration (FDA) to treat lymphoblastic leukemia, lymphoma, and vision loss, demonstrating just how far this field has come. FDA Commissioner Dr. Scott Gottlieb and I reflect on the history and future of our agencies’ respective roles in ensuring the safety of gene therapy and other biotechnologies in a Perspective published in the New England Journal of Medicine. Given the recent scientific and clinical breakthroughs in gene therapy, NIH and FDA are working together to ensure the federal framework for oversight keeps pace. With the evolution of the field of gene therapy, duplication in reviews and paperwork have sometimes occurred without a commensurate increase in protecting participant safety. For instance, both agencies require initial registration of a gene therapy protocol and updates as the trial proceeds, which is not required of any other field of clinical research. NIH and FDA propose to streamline this oversight by eliminating unnecessary duplicative reporting requirements. NIH also intends to restore the NIH Recombinant DNA Advisory Committee (RAC), which has long played a role in advising the NIH director on gene therapy, to its original vision by proposing it focus on the scientific, safety, and ethical issues associated with new and emerging biotechnologies. In this capacity, the RAC will maintain the same level of transparent discourse it has provided for more than four decades. During the comment period and effective immediately, the NIH will no longer accept new human gene transfer protocols for the protocol registration process under the NIH Guidelines for Research Involving Recombinant or Synthetic Nucleic Acid Molecules (NIH Guidelines), or convene the RAC to review individual human gene transfer protocols. The NIH Office of Science Policy will also not accept annual reports, safety reports, amendments or other documentation for any previously registered human gene transfer protocols under the NIH Guidelines. The roles and responsibilities of Institutional Biosafety Committees (IBCs) at the local level will continue as described in the NIH Guidelines. These trials remain subject to FDA and other clinical trial regulations, and only after FDA, IBC, and other relevant approvals are in place can these protocols proceed. We hope this interim step will ease some of the burden for research that already falls under FDA oversight as NIH considers the proposed changes outlined in the Federal Register. We are in an era of exceptional opportunities for biomedical research made possible by unprecedented advances in biotechnology. Genome editing, synthetic biology, and innovative neurotechnologies are just a few of the advances that show promise in providing medical breakthroughs. We are both optimistic and cautious as we consider their promise and implications. I want to express deep appreciation to the RAC for their efforts over many years to advance gene therapy so that patients' hopes can materialize into treatments.